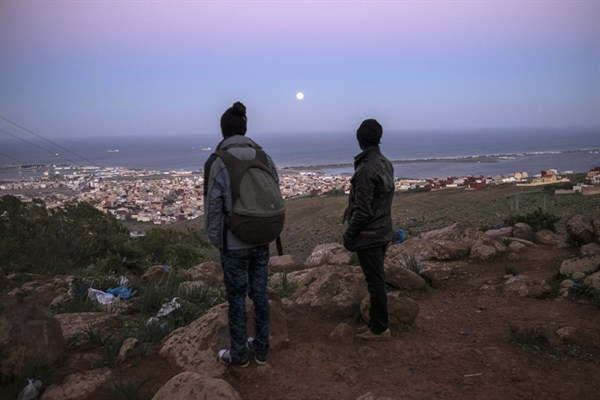 Young Malian migrants watch the border between Morocco and the Spanish enclave of Melilla from a clandestine immigrant camp located at Mount Gourougou, near Nador, Morocco, Nov. 6, 2014 (AP photo by Santi Palacios). Migration from Africa to Europe is a hotly debated topic. Headlines about migrants crossing the Sahara Desert or the Mediterranean Sea appear regularly in major international newspapers, most infamously in April, when at least 1,000 migrants died on two capsized ships between Libya and Italy. In Brussels, European leaders meet frequently to discuss policy responses to irregular border crossings and migrant deaths at sea, time and again advancing cooperation with North African states as a potentially successful strategy. But reporting has mainly focused on the European perspective, while North African states’ policy approaches and civil societies’ attitudes toward irregular migrants have largely been ignored. This perspective is essential, however, to fully grasping the migration dynamics unfolding in the region and to working out sensible policy solutions.